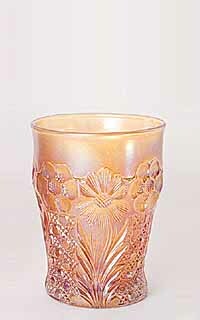 This pattern has a combination of delicate flowers interspersed by areas of cane. 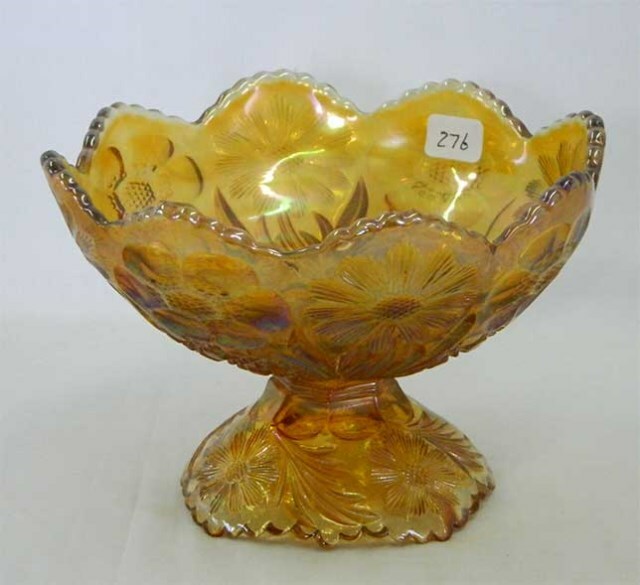 Pieces are found in a rich marigold-type color with a honey tinge (that collectors call honey amber) as well as marigold and white with a few pieces appearing in amethyst. 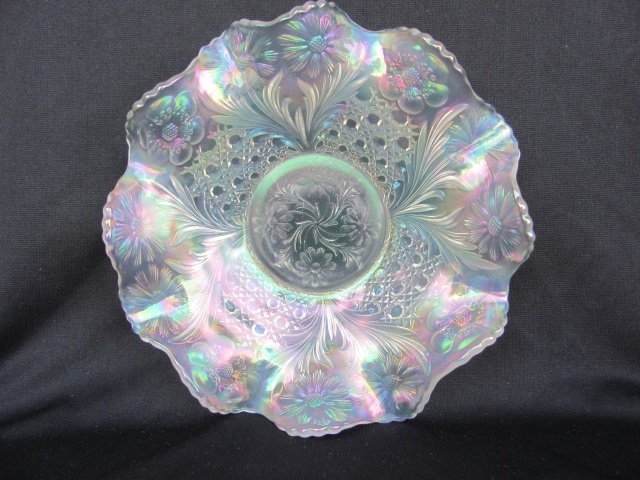 There are many and varied shapes in this pattern, most of which can be called whimsies. 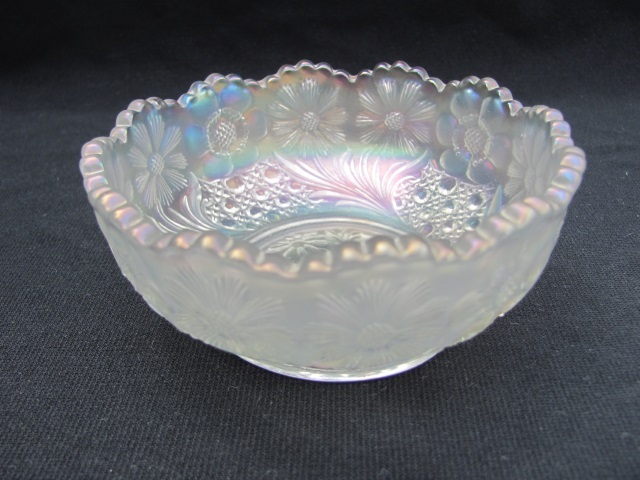 Most small bowls are found in shapes other than round, square or tricorner for example. 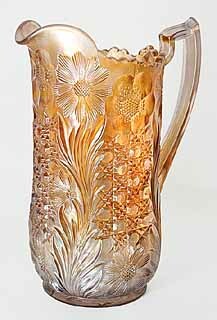 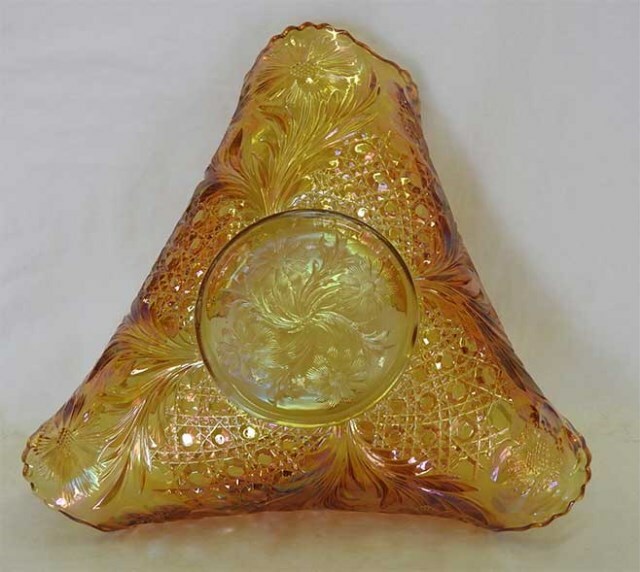 The tumbler and pitcher above are both in honey amber. 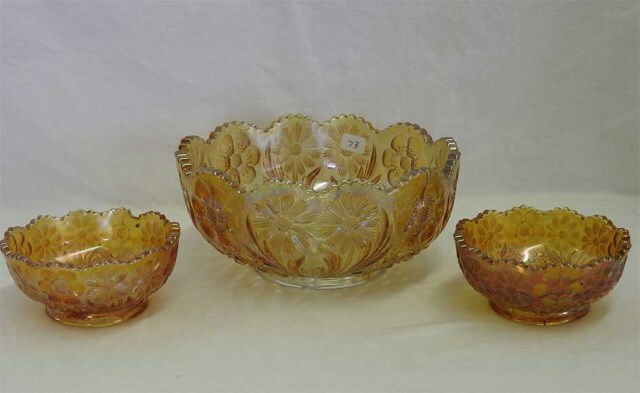 Bowls are found in both round (above left) and ruffled (above right). 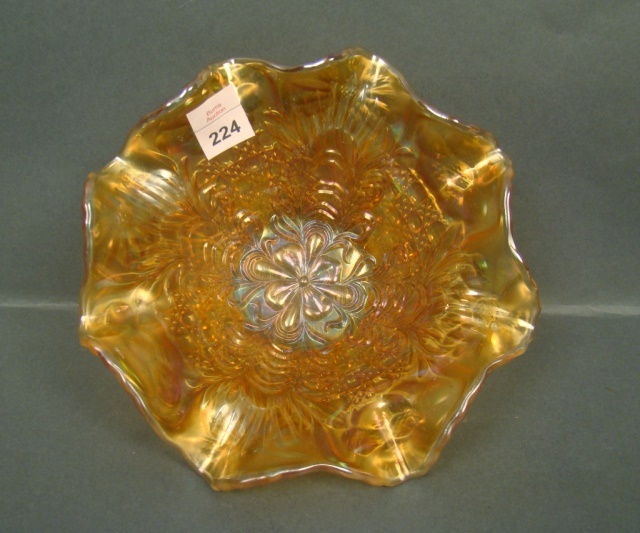 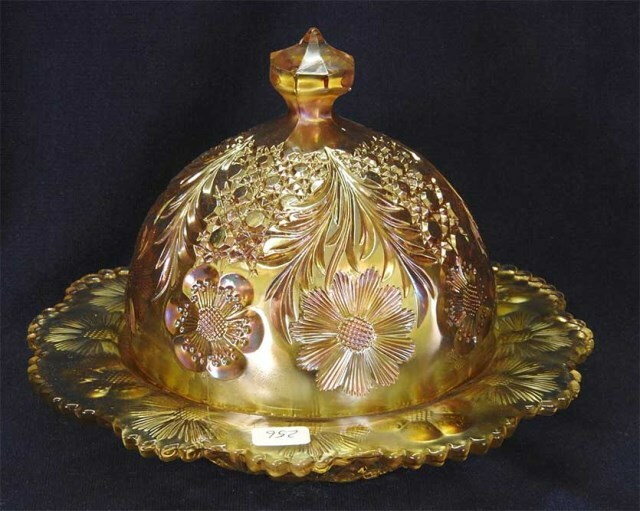 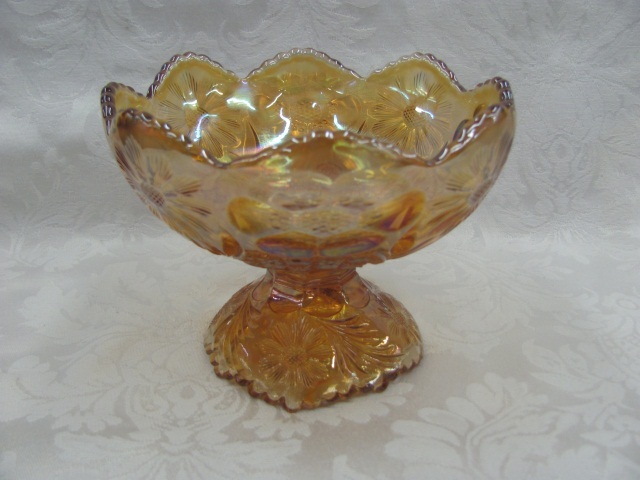 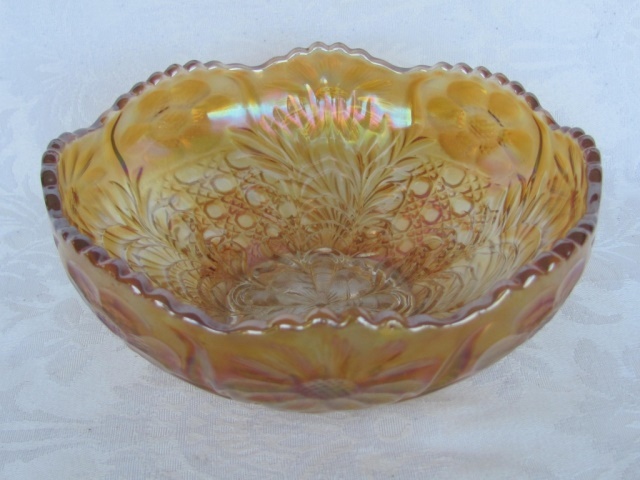 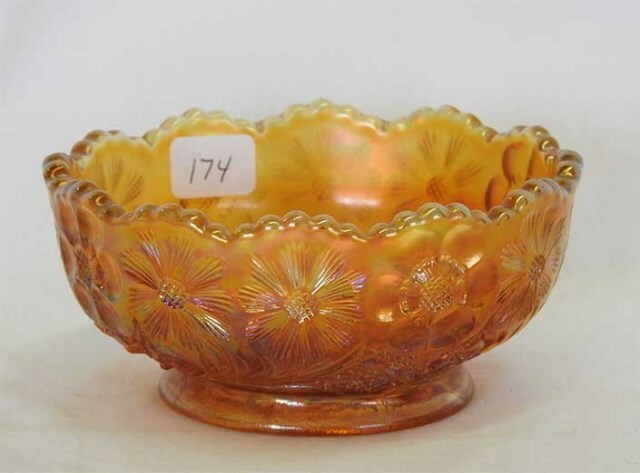 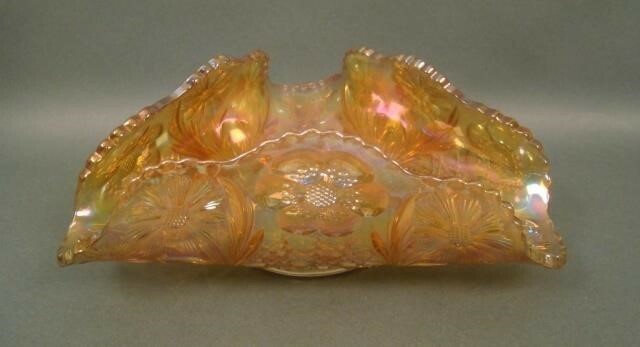 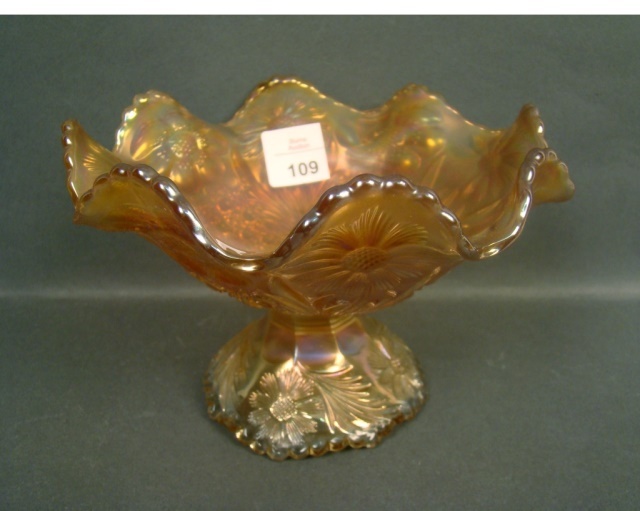 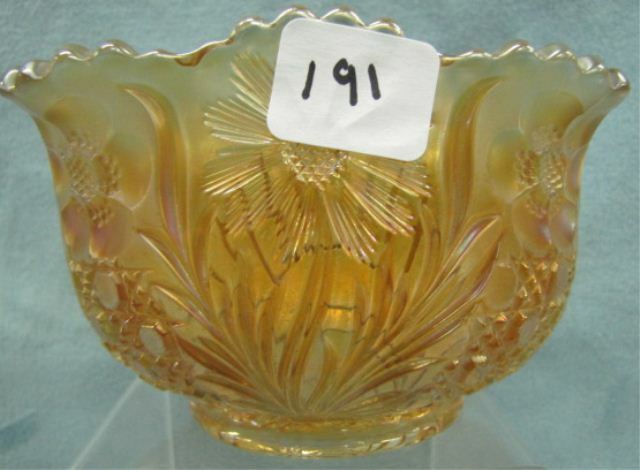 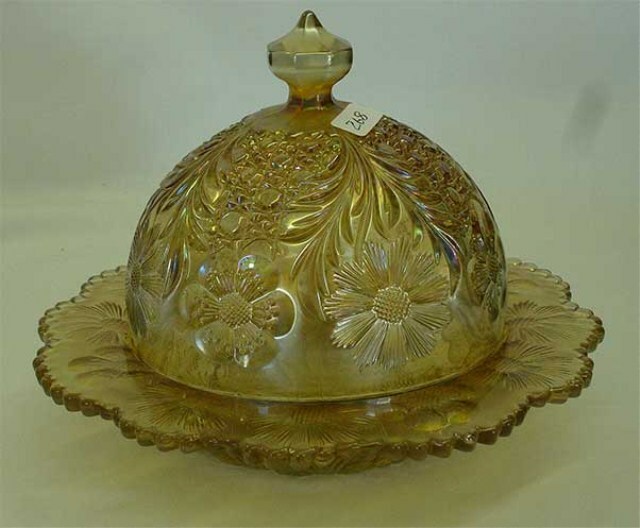 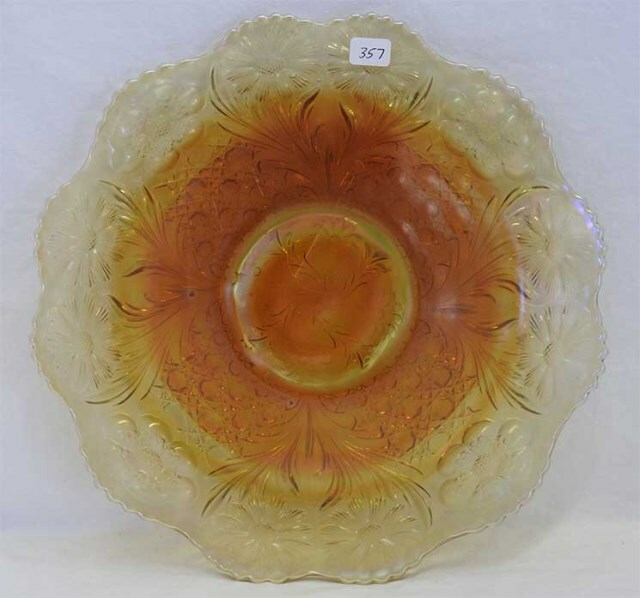 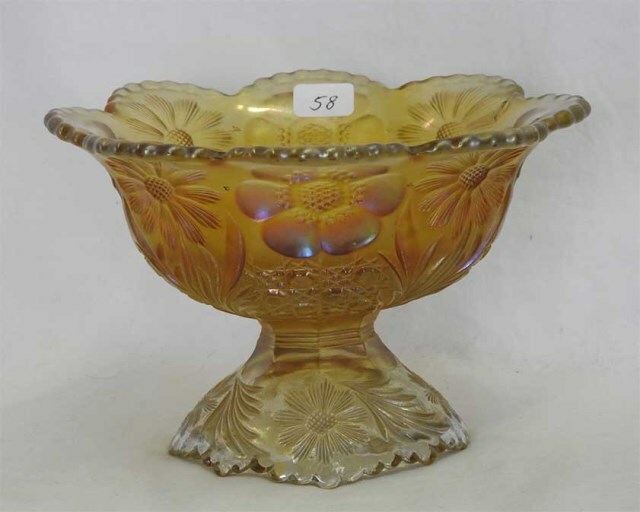 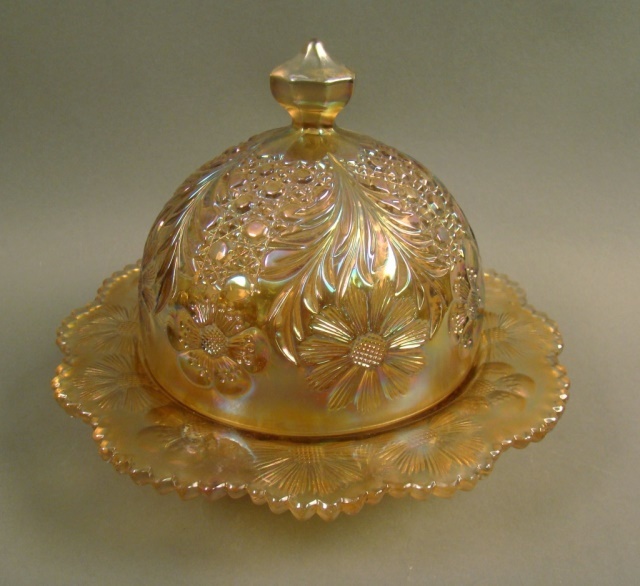 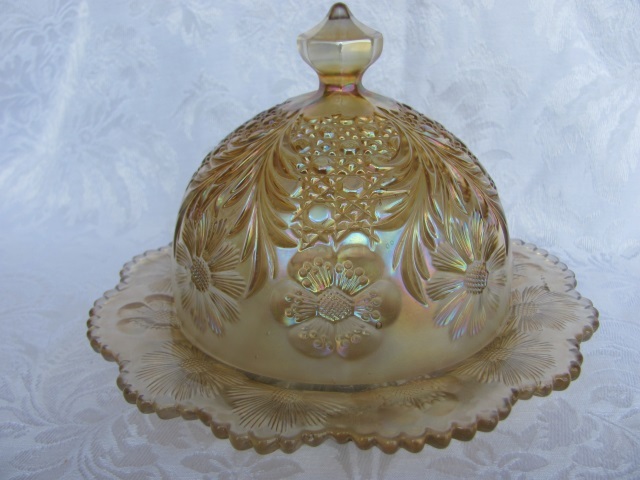 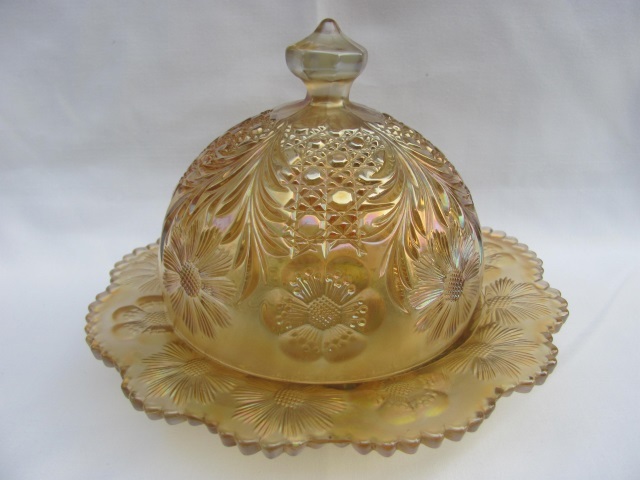 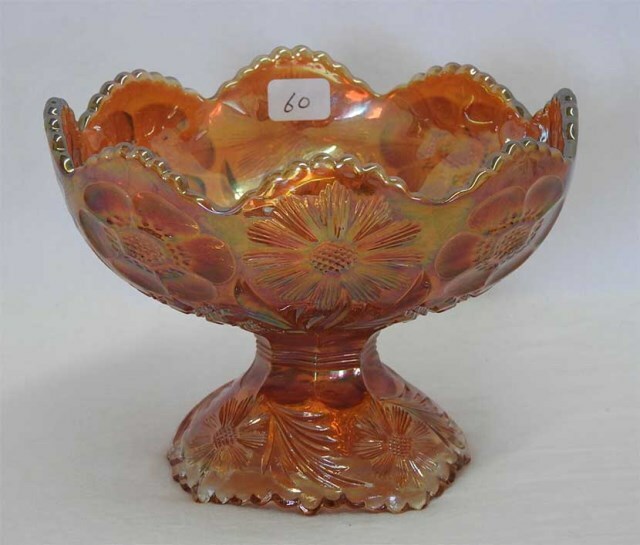 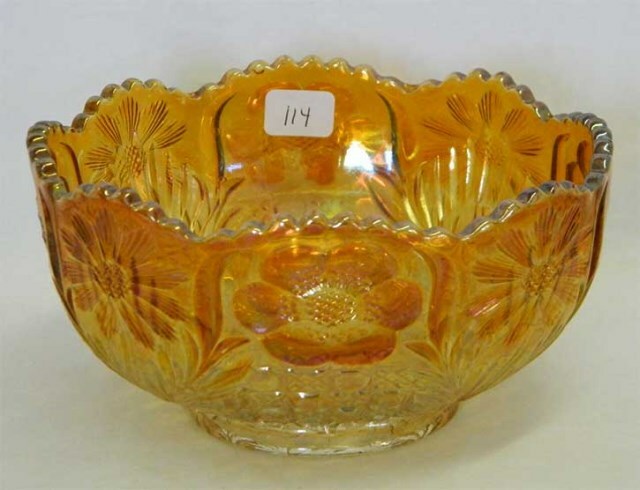 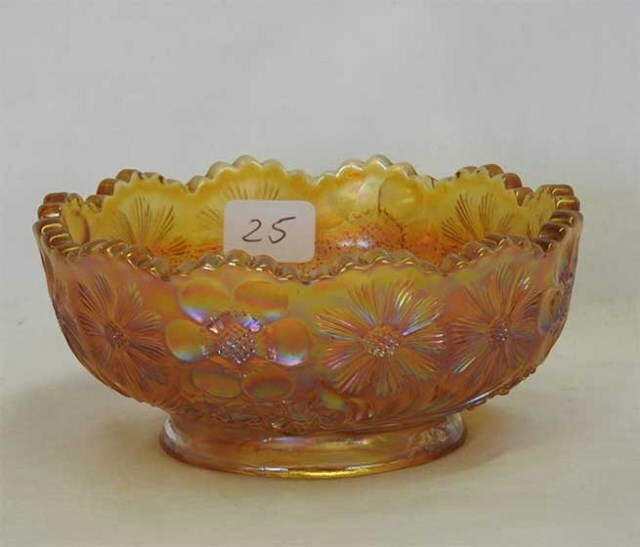 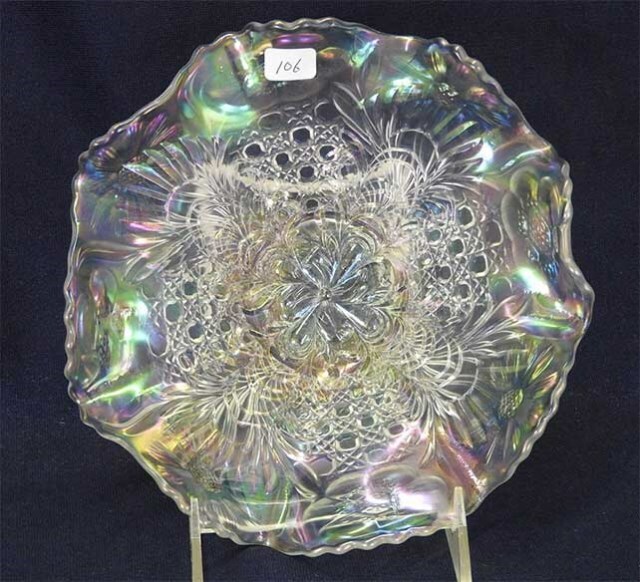 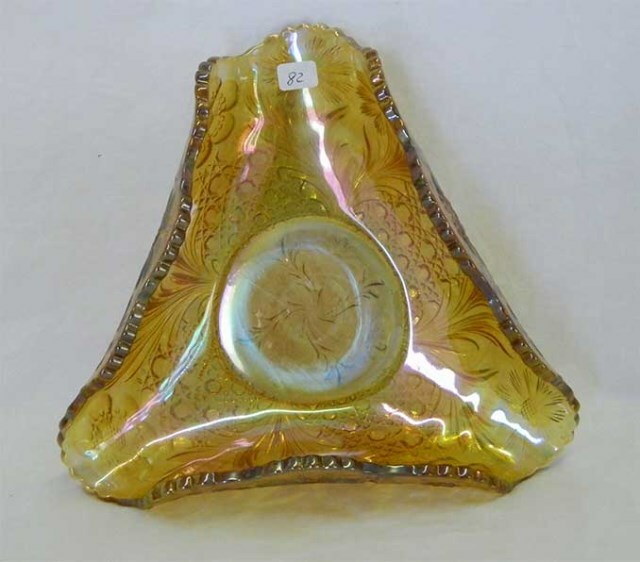 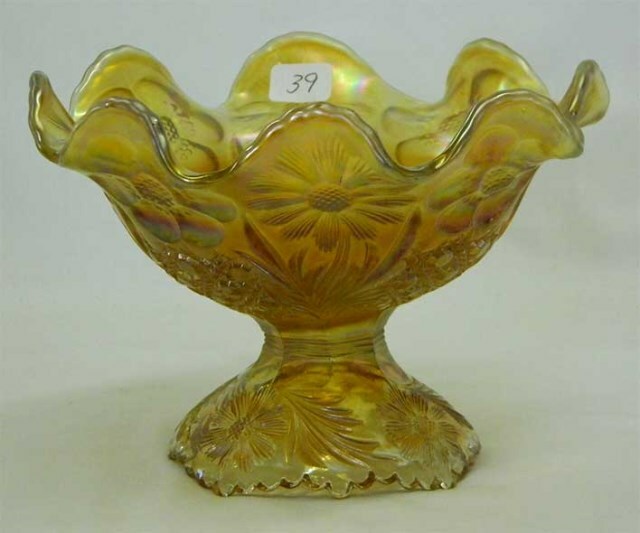 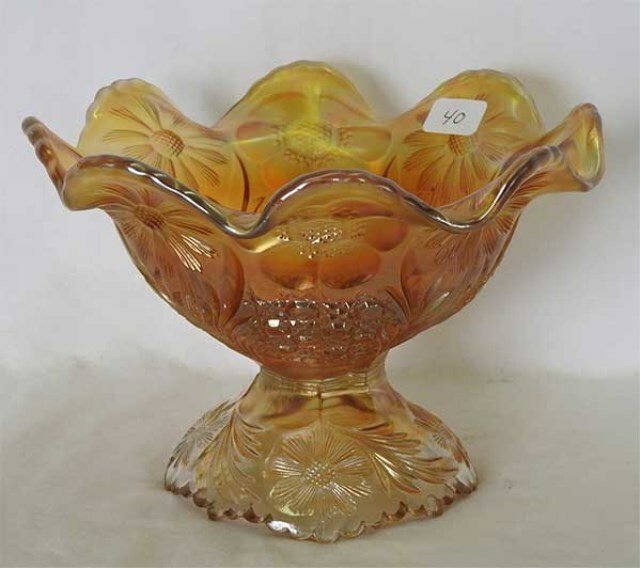 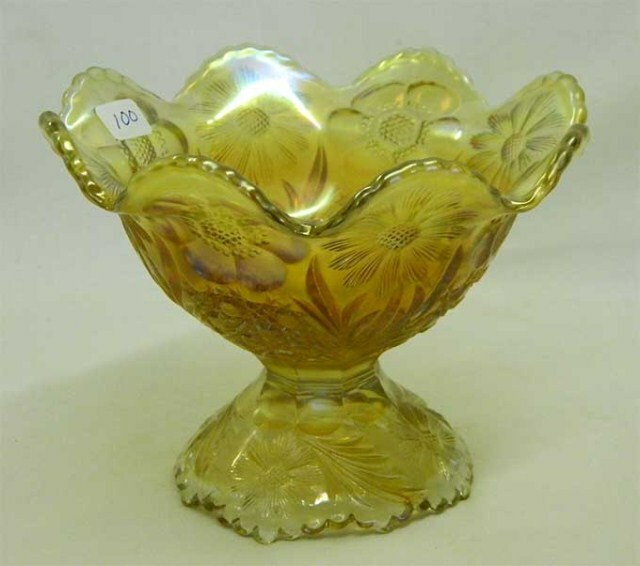 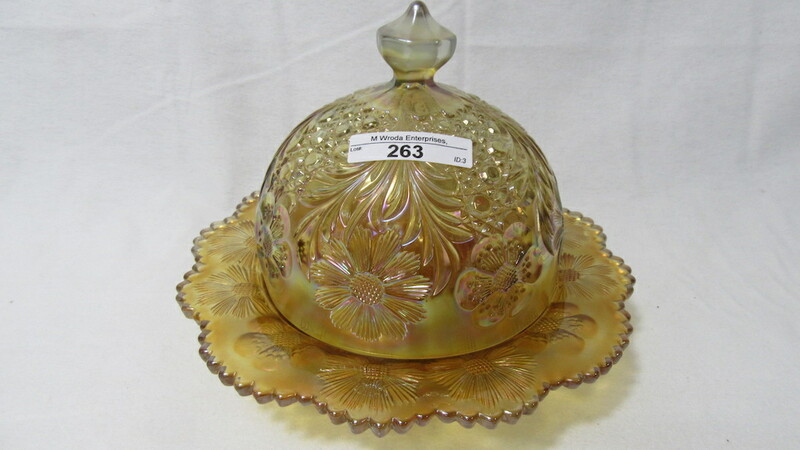 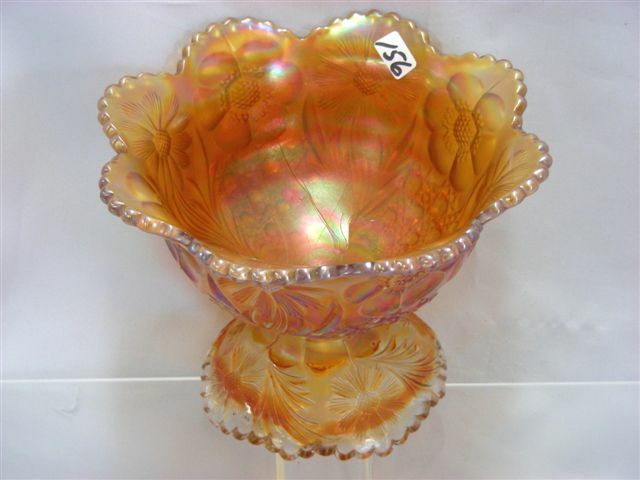 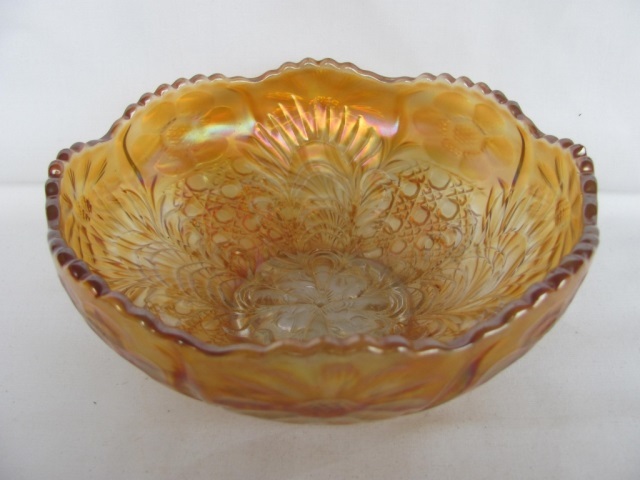 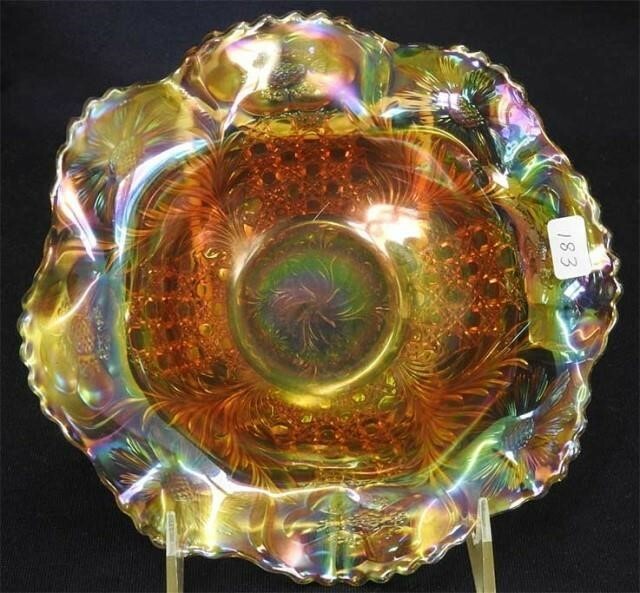 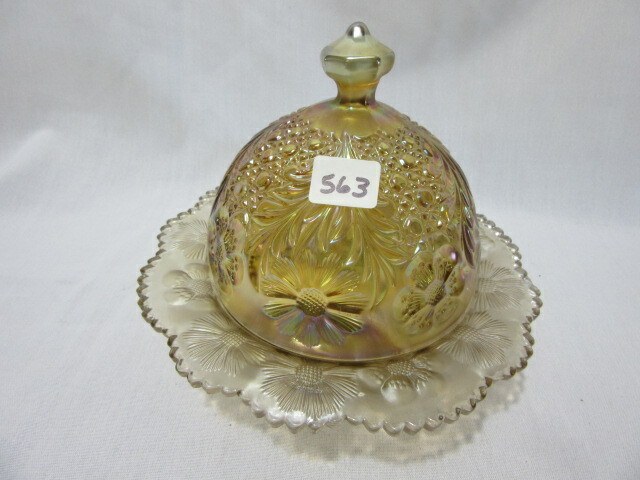 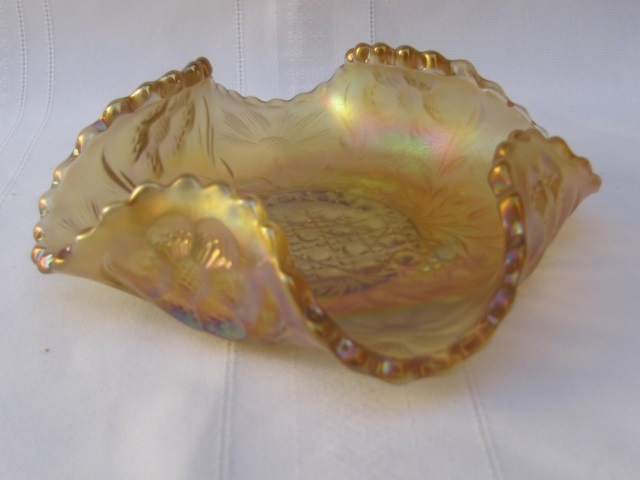 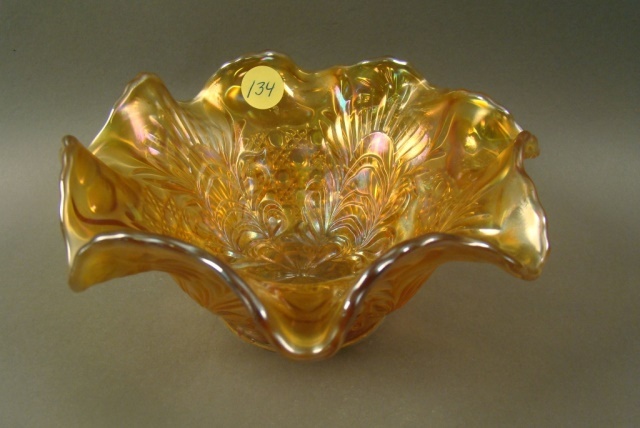 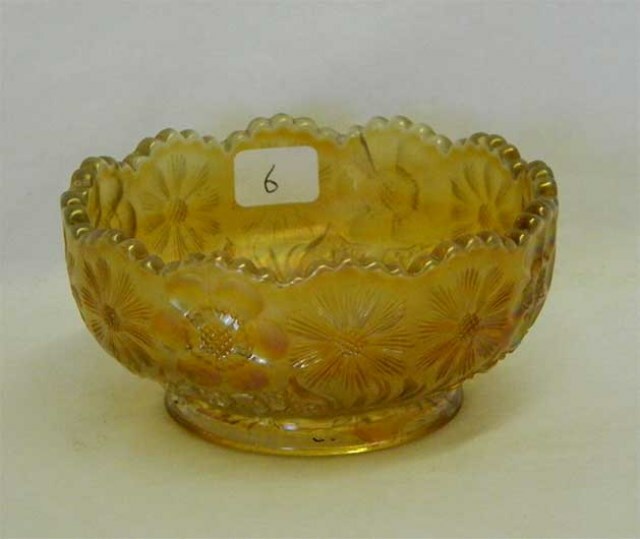 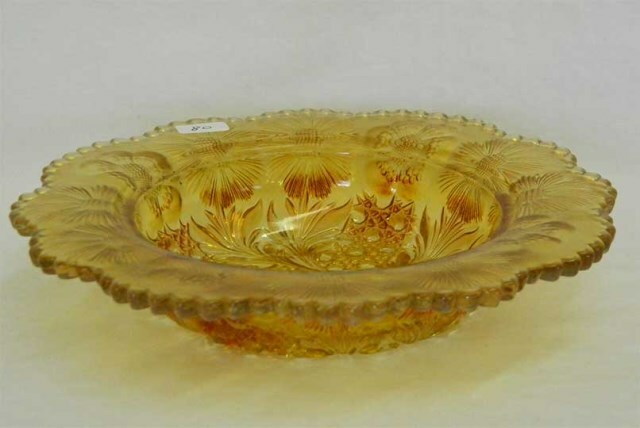 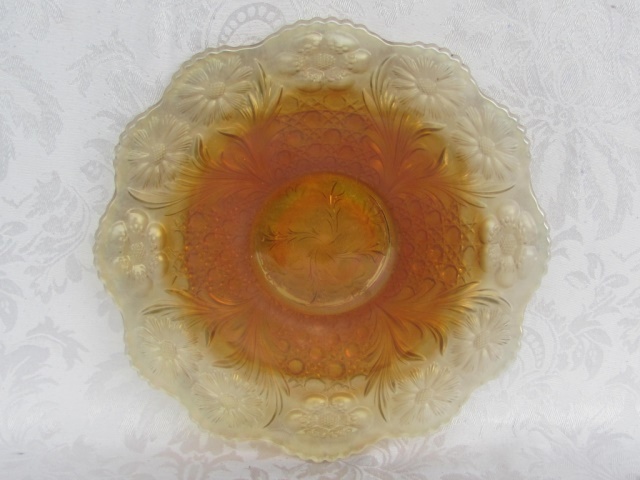 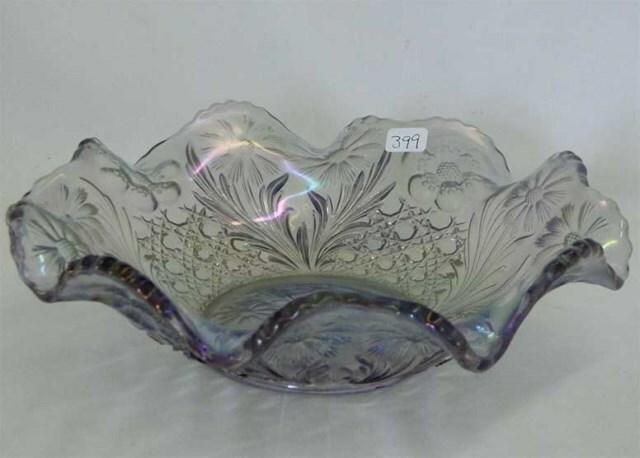 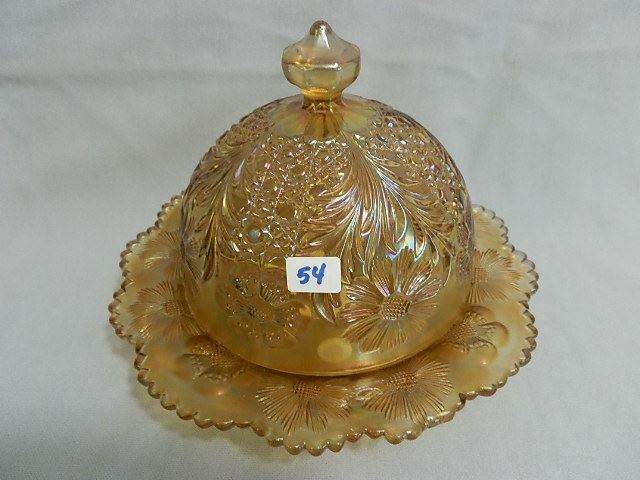 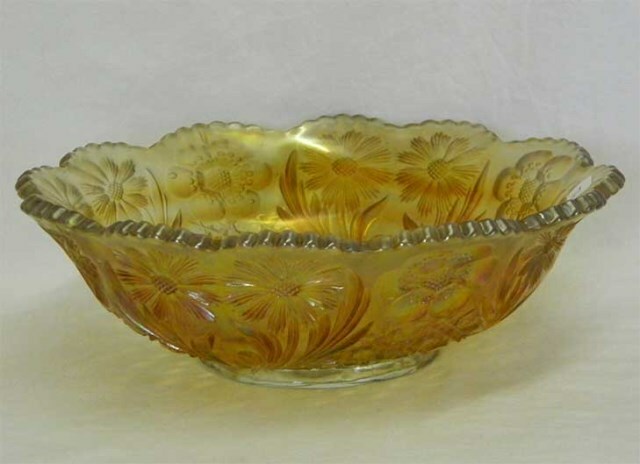 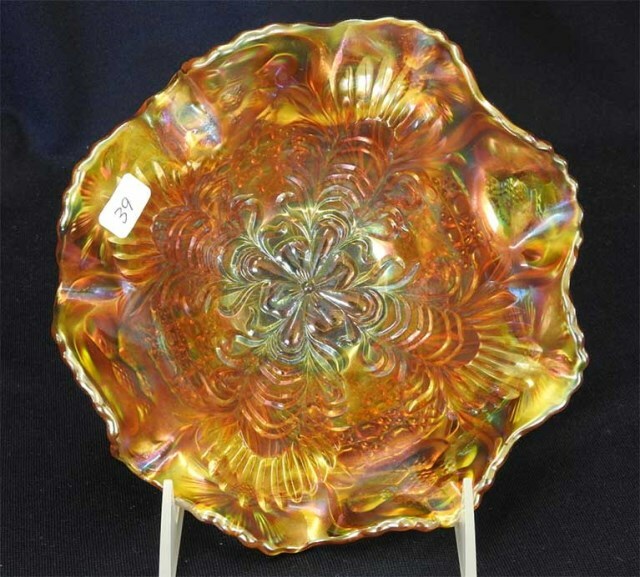 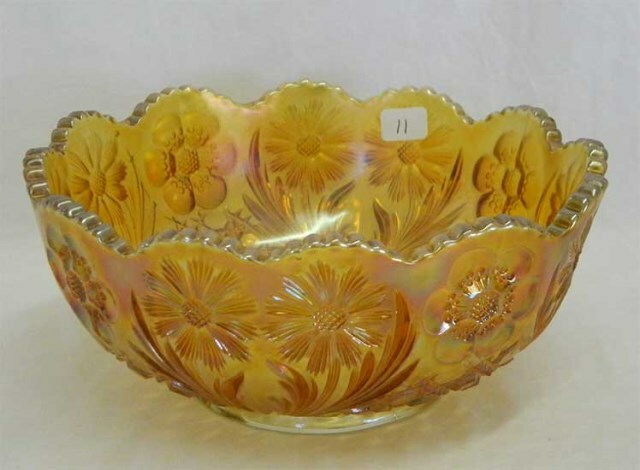 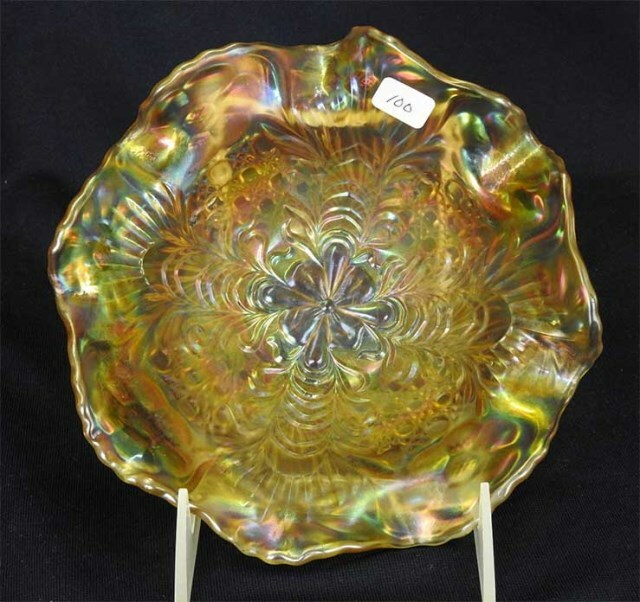 The round is honey amber and measures 7 1/2 inches across, the ruffled is white. 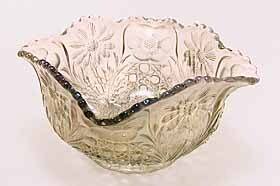 Some of these bowls are seen with a pattern on the inside called Headdress. 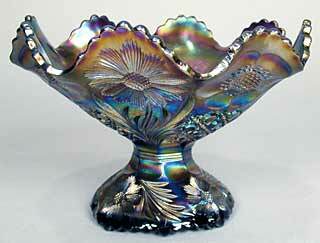 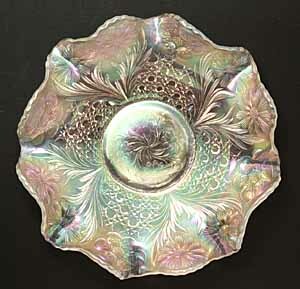 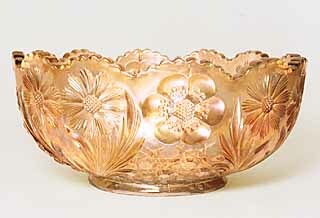 Bowls in the Cosmos and Cane pattern were often formed into shapes other than round or ruffled. 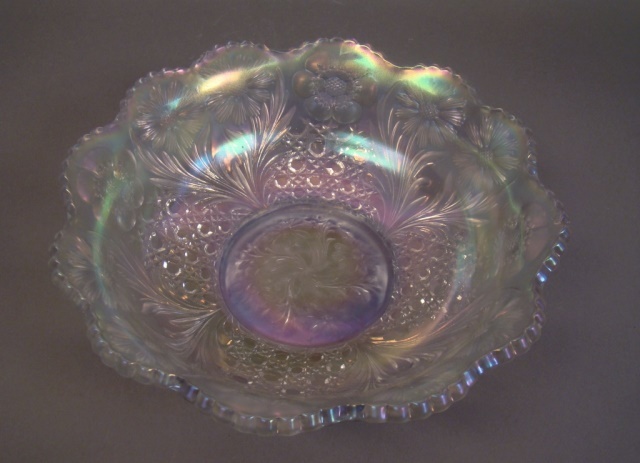 While they are called whimsies, in reality there are enough in the various shape that it is safe to assume they were actually production items. 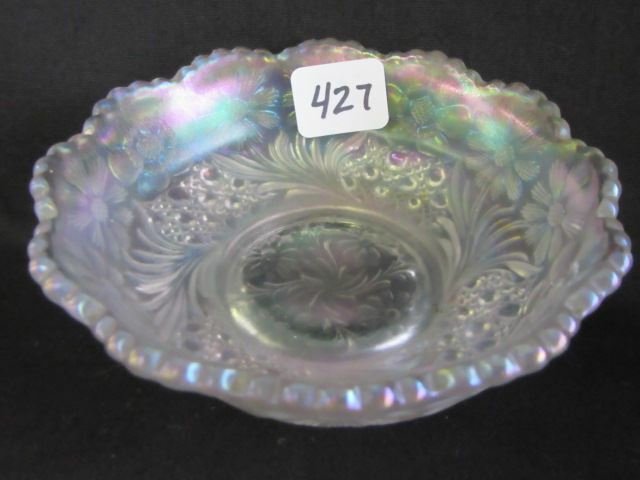 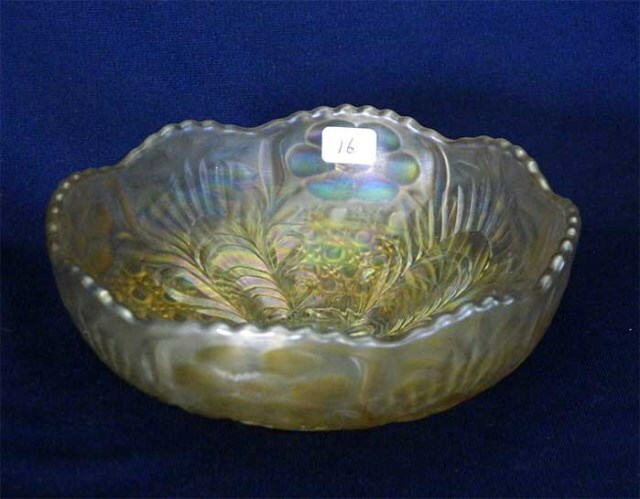 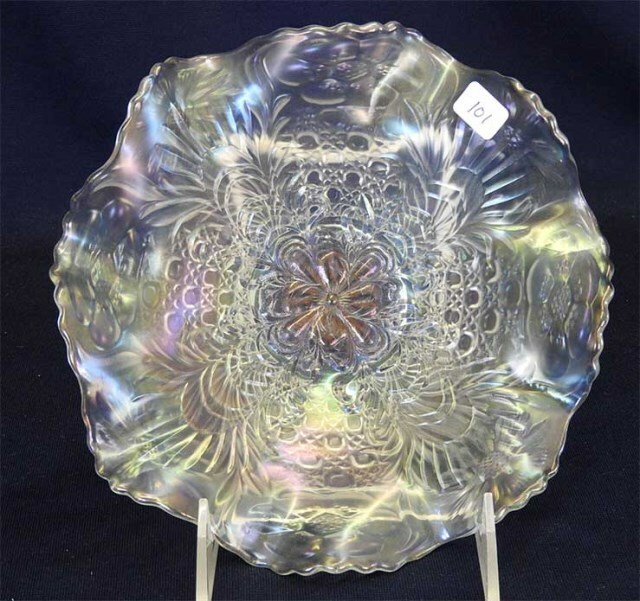 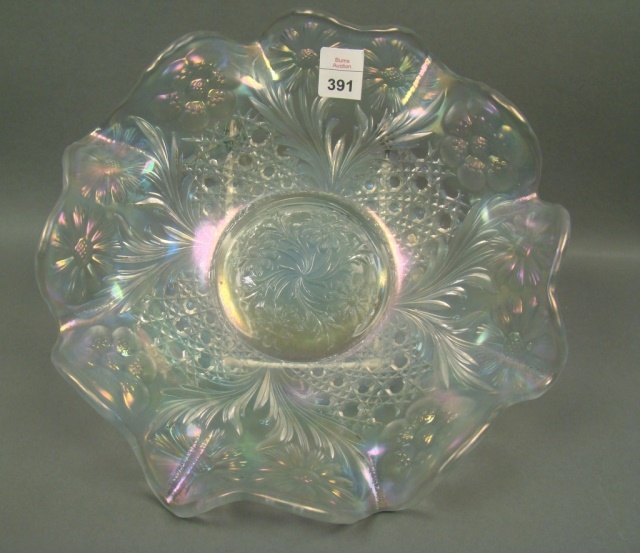 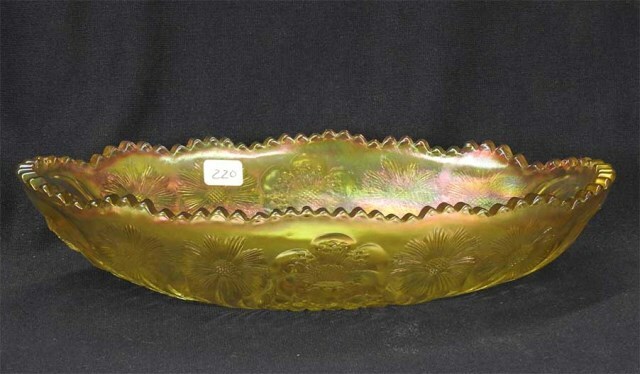 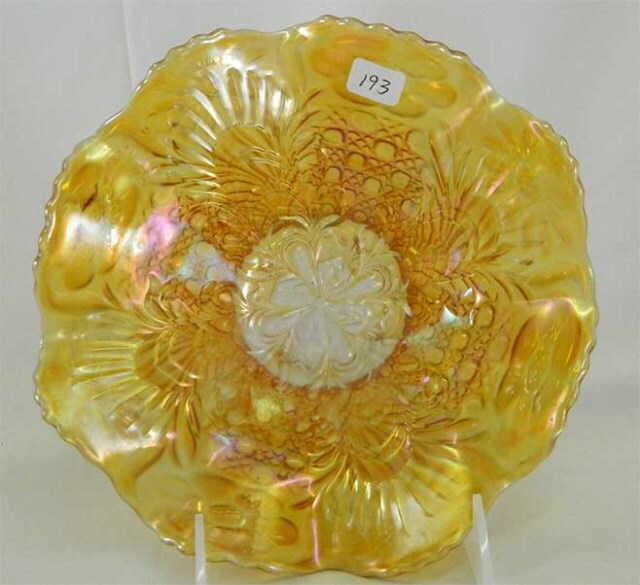 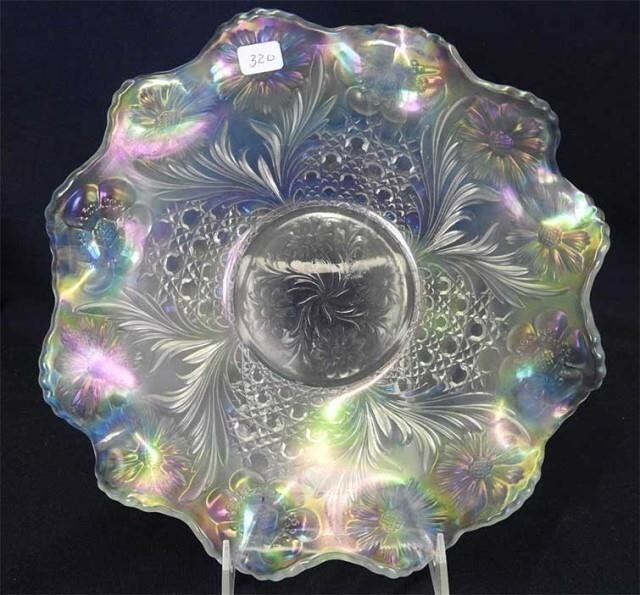 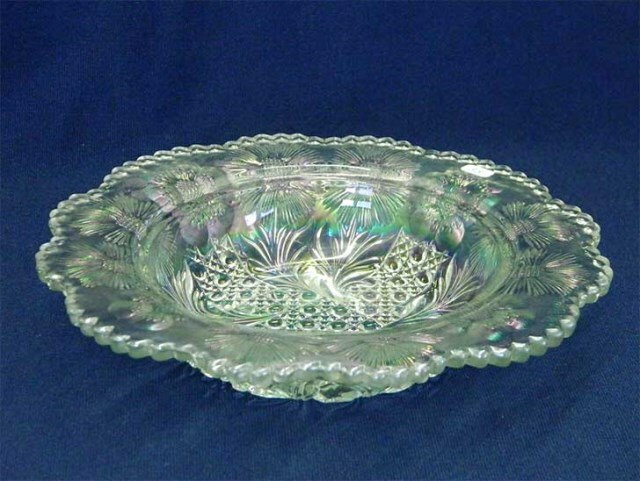 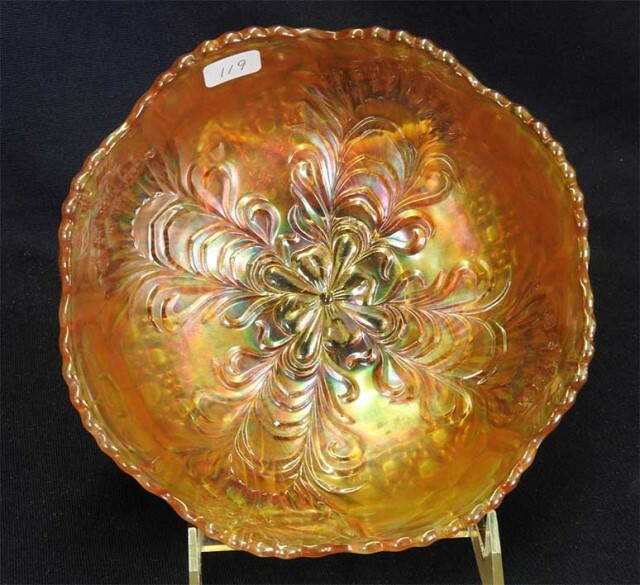 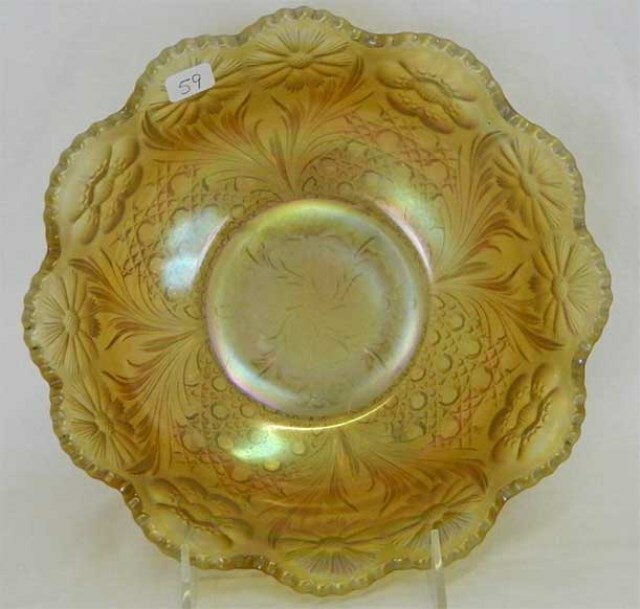 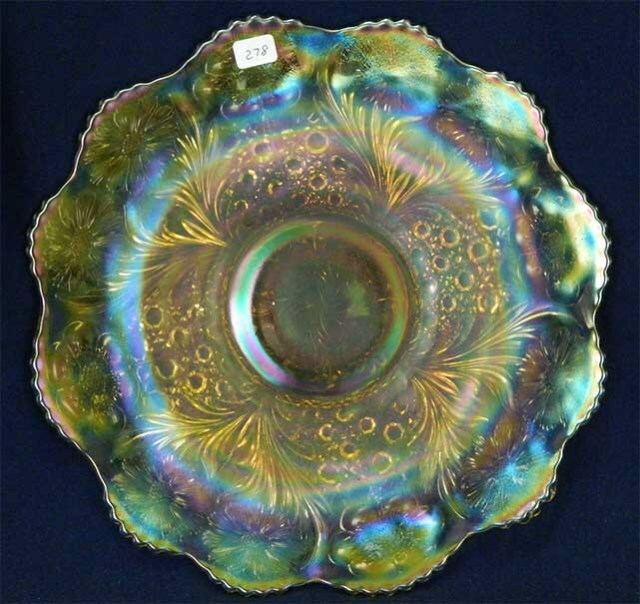 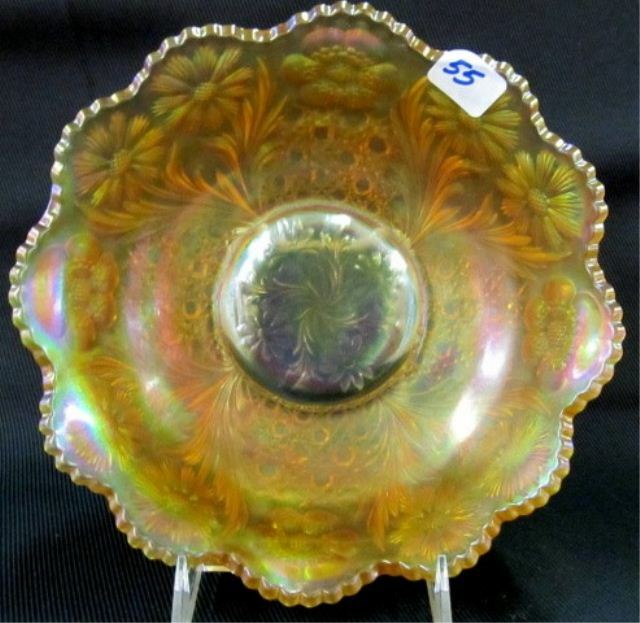 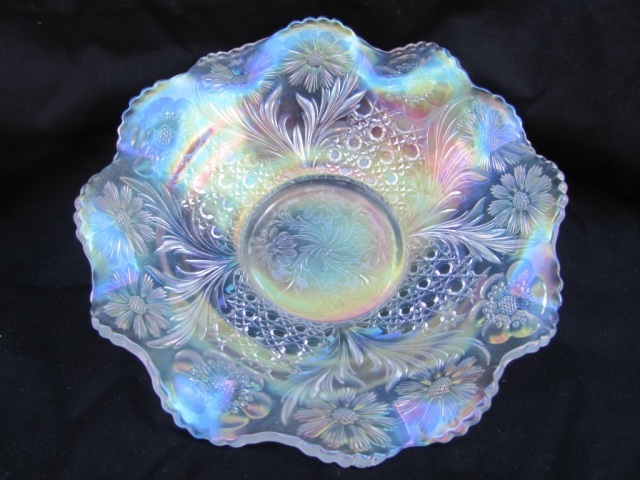 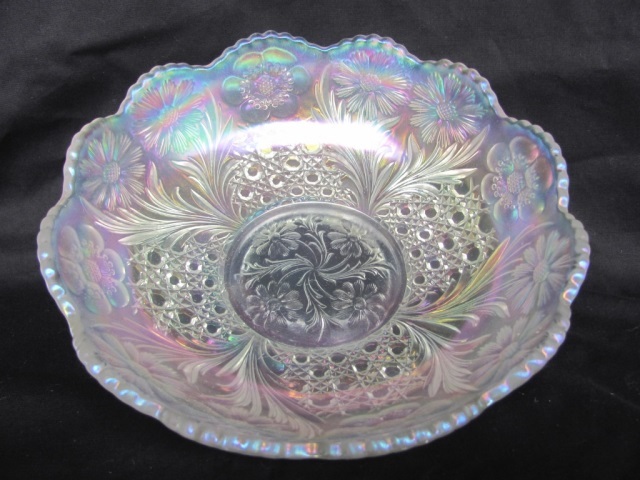 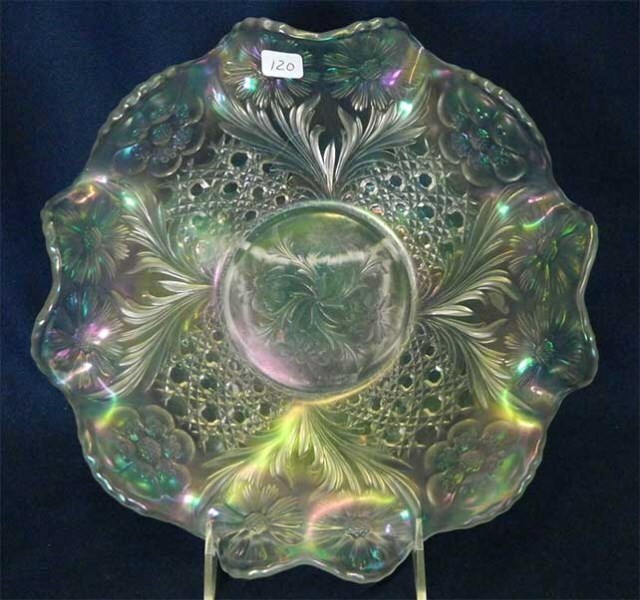 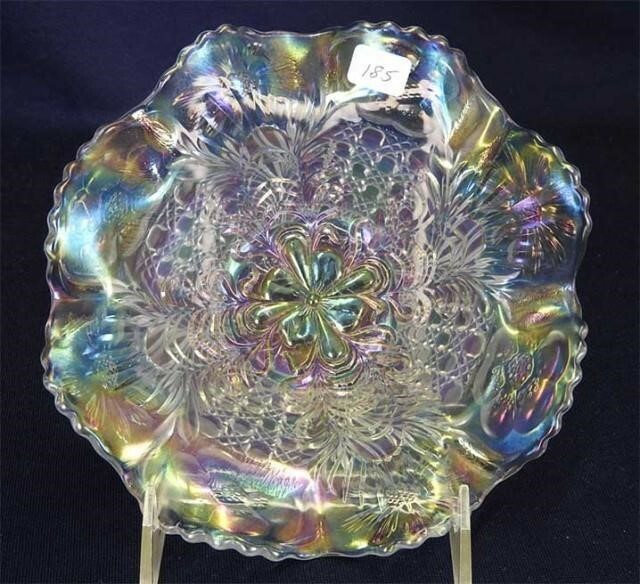 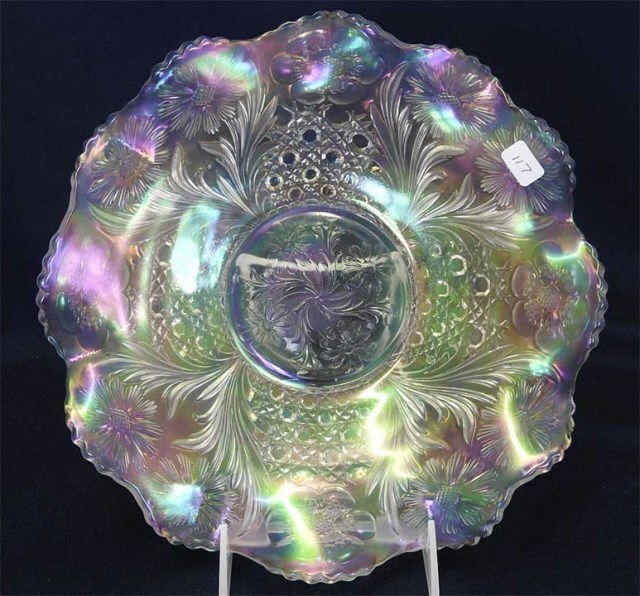 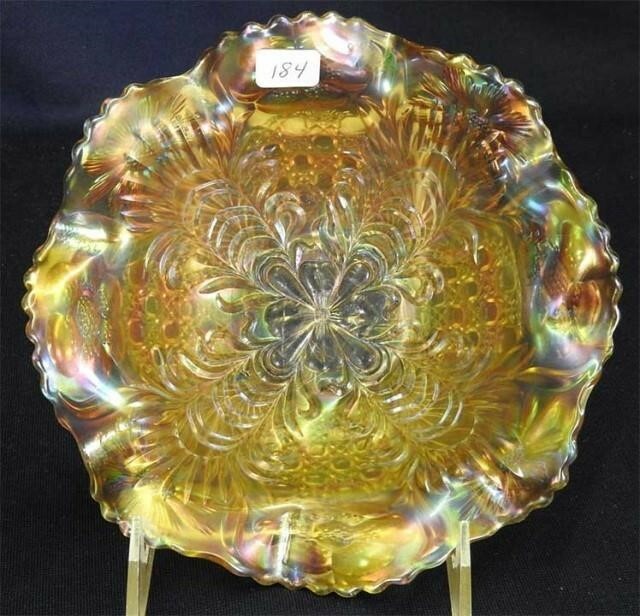 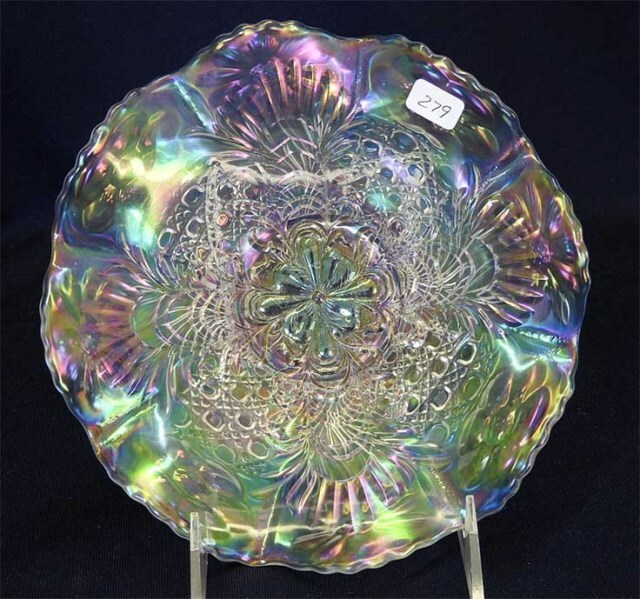 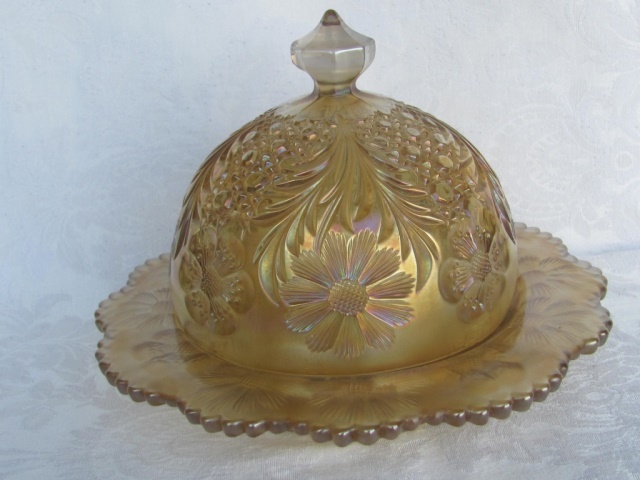 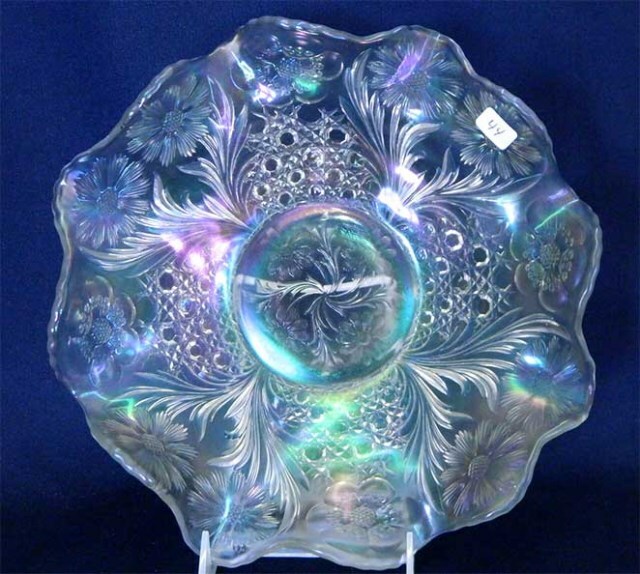 Above are a square bowl in white, 5 1/4 inches across and 3 1/8 inches high that sold for $255 in 1998, and a tri-cornerd plate or bowl in marigold, 9 to 10 inches across, that sold for $200 in 1999. 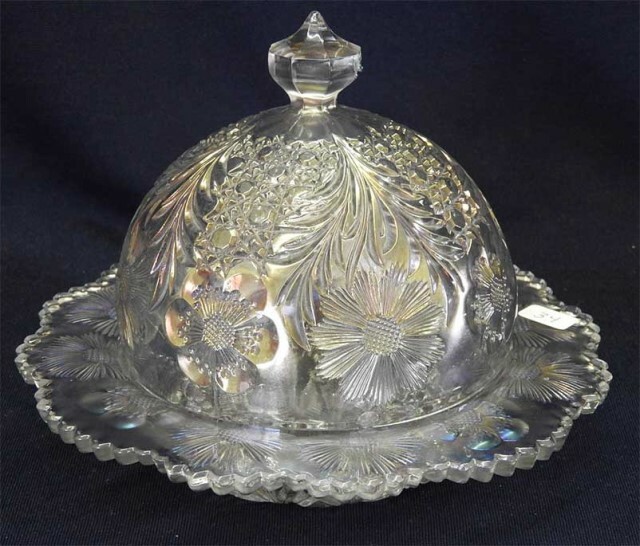 Table sets consist of four pieces; a two-handled spooner, a two-handled covered sugar, a covered butter dish, and a creamer. 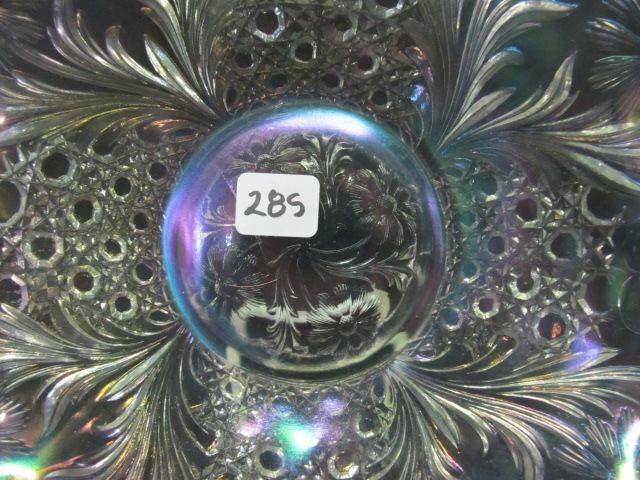 Complete table sets are very rare. 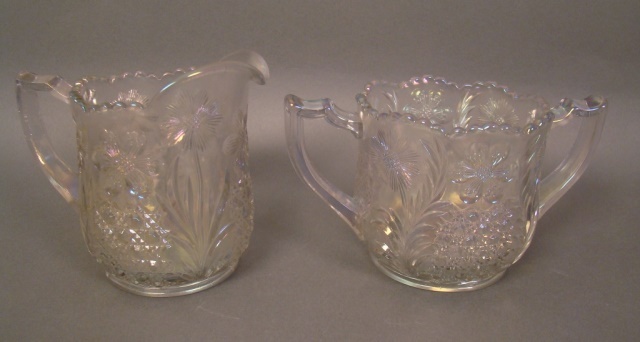 Breakfast sets (also rare) are made up of a squatty two-handled open sugar and a creamer, both smaller than those in the table set. 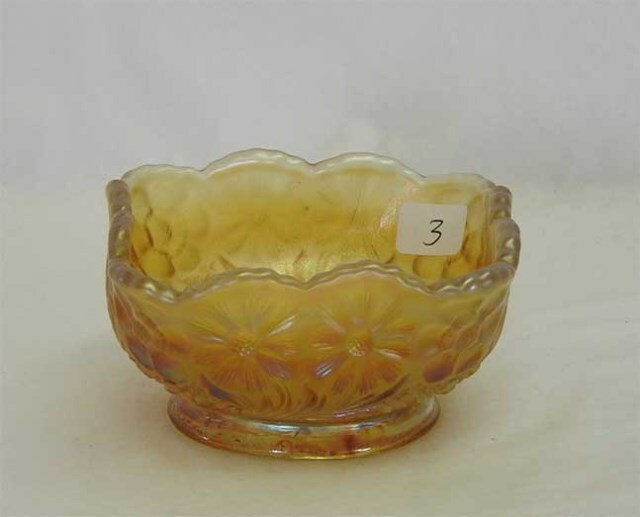 They are known in marigold and white. 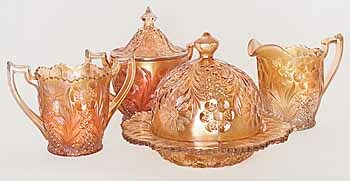 Note the difference in the shape of the handles. 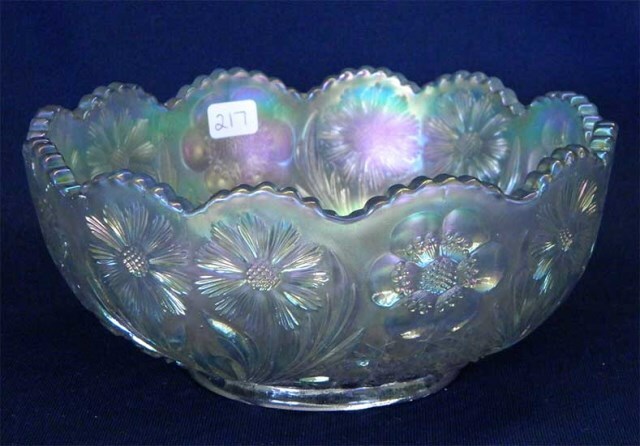 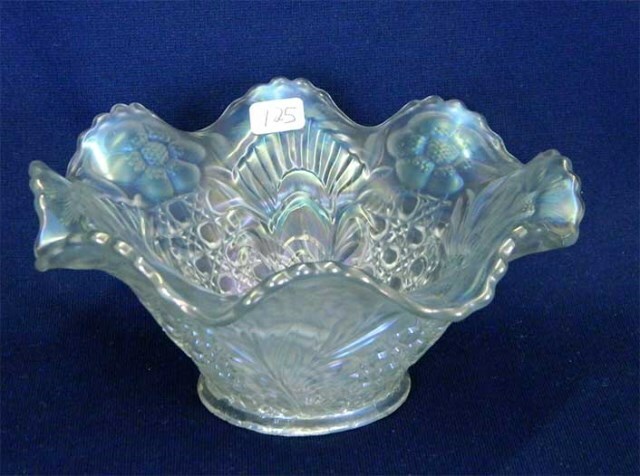 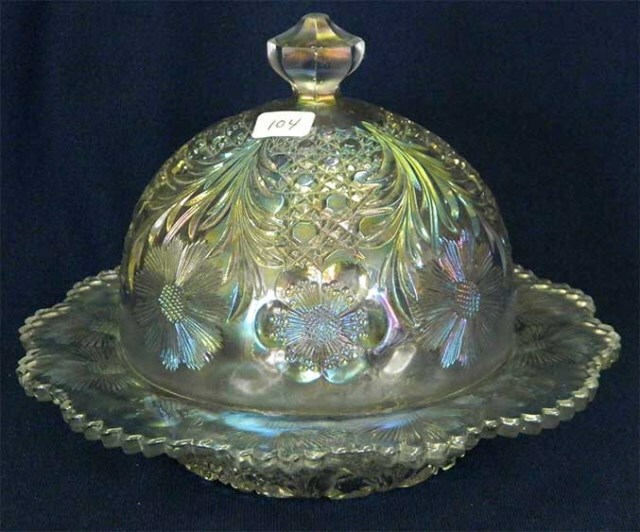 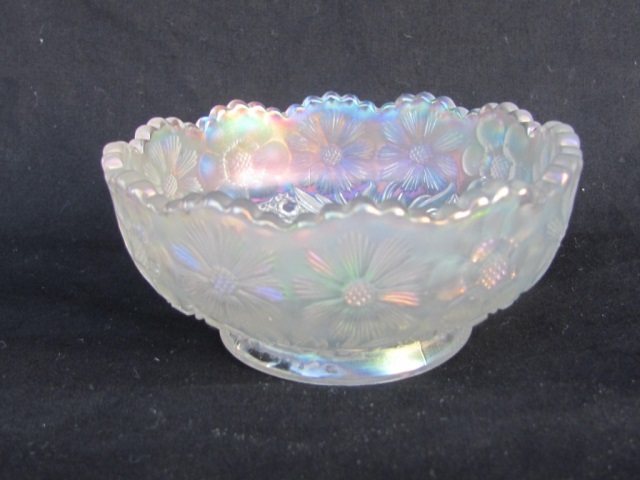 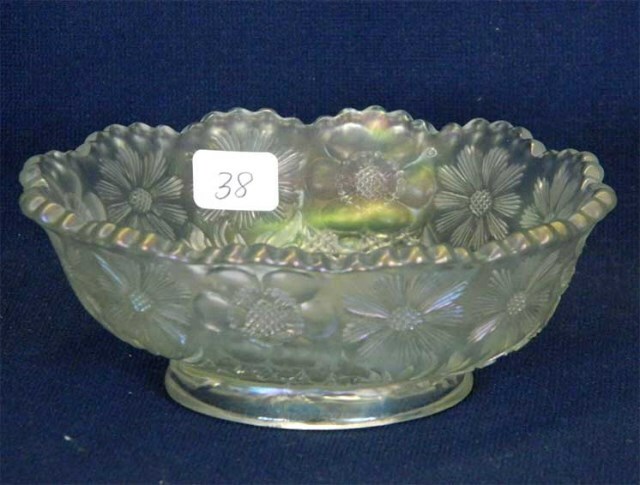 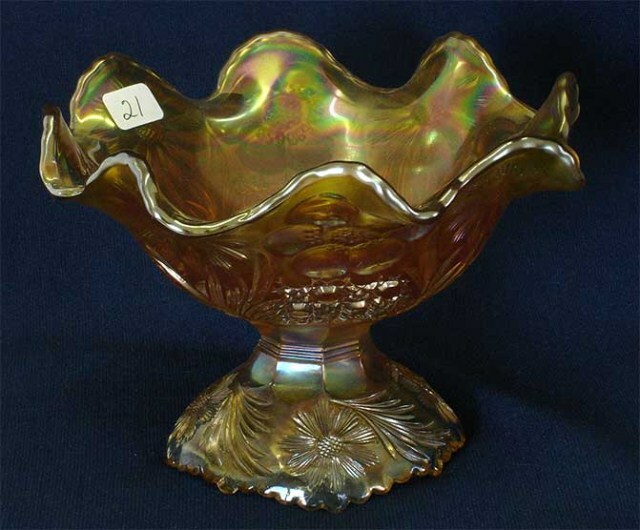 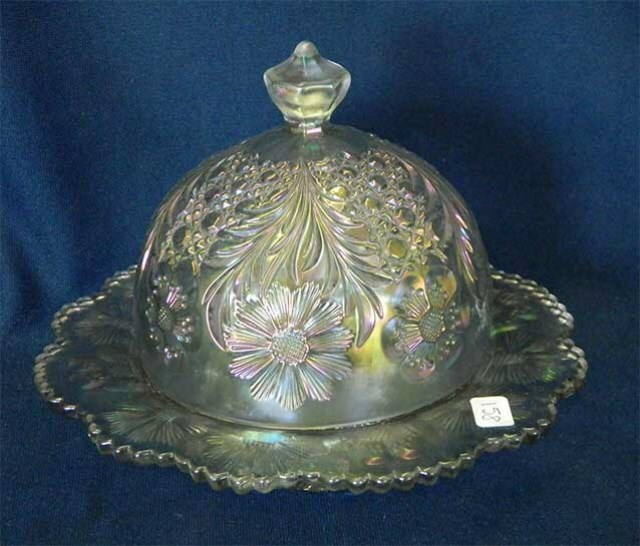 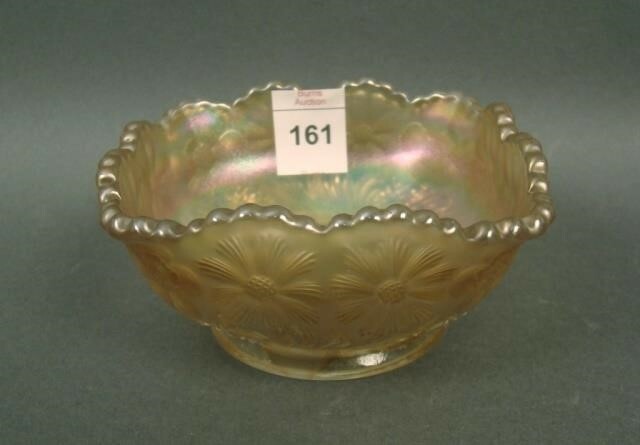 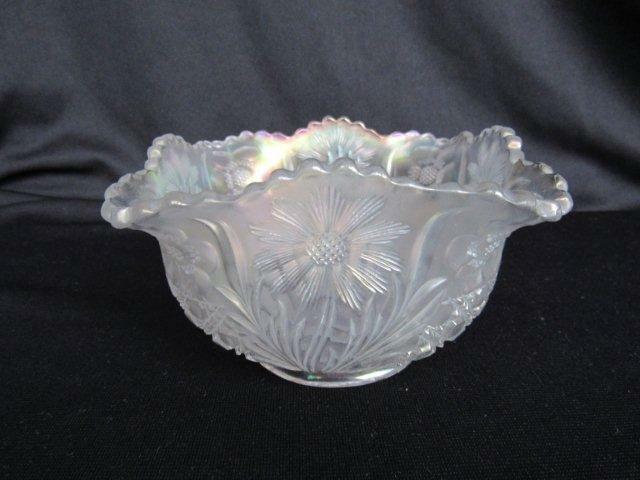 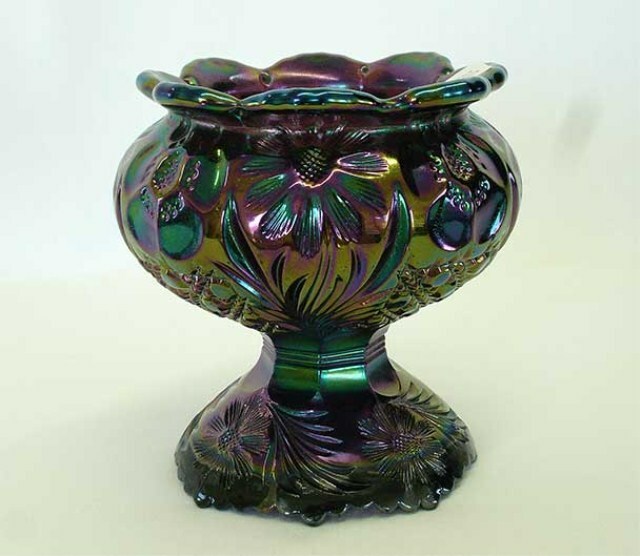 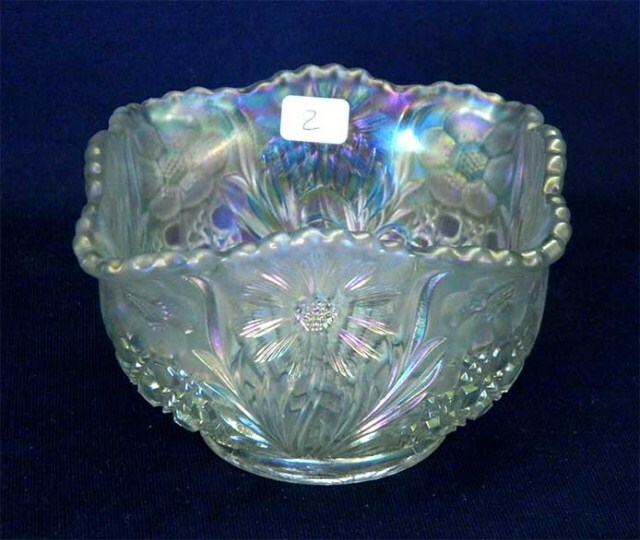 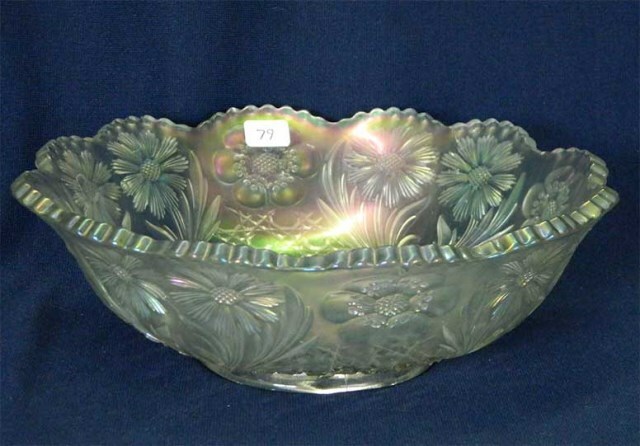 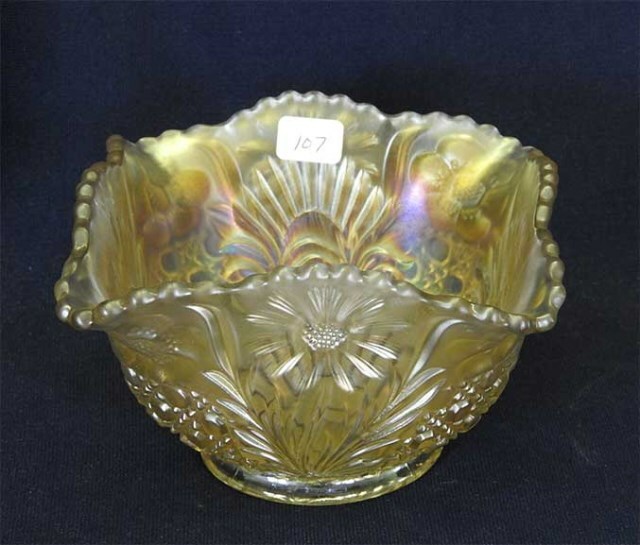 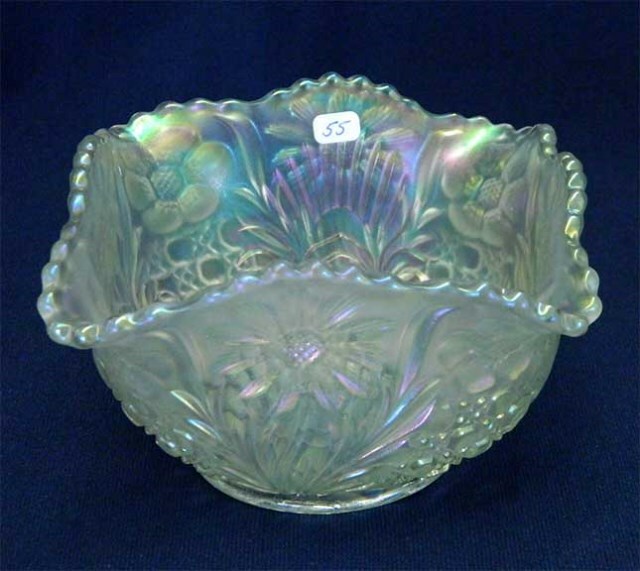 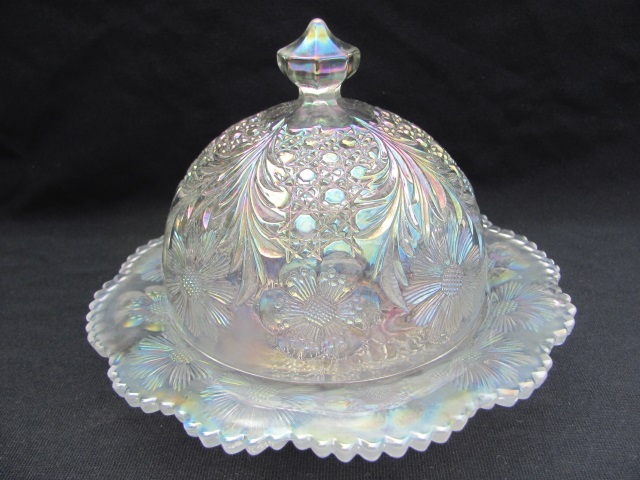 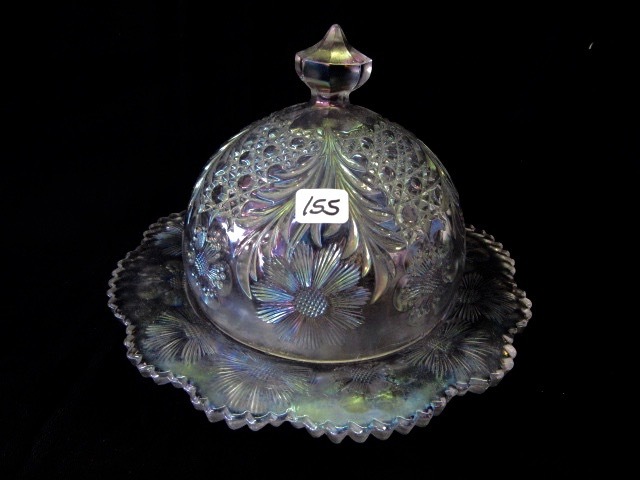 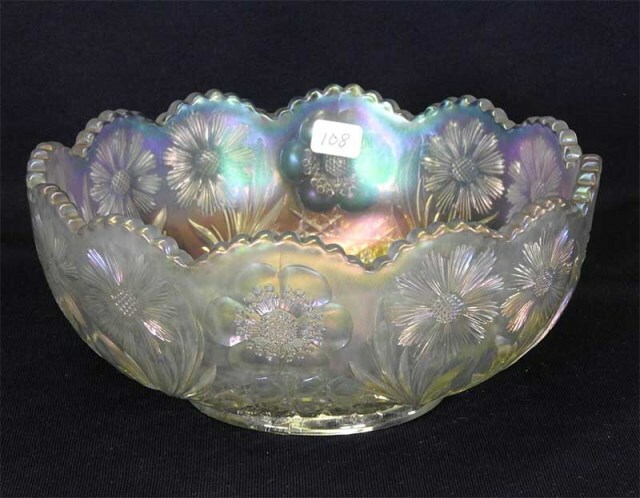 Rosebowls were made from two sizes of bowls. 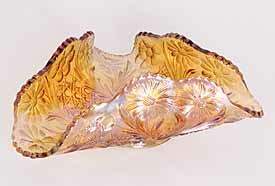 Some had the Headdress interior. 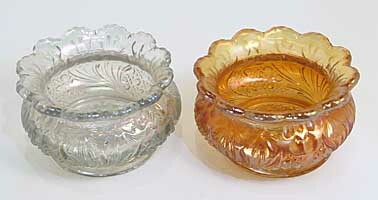 Compotes were made in two forms, stemmed and dome footed. 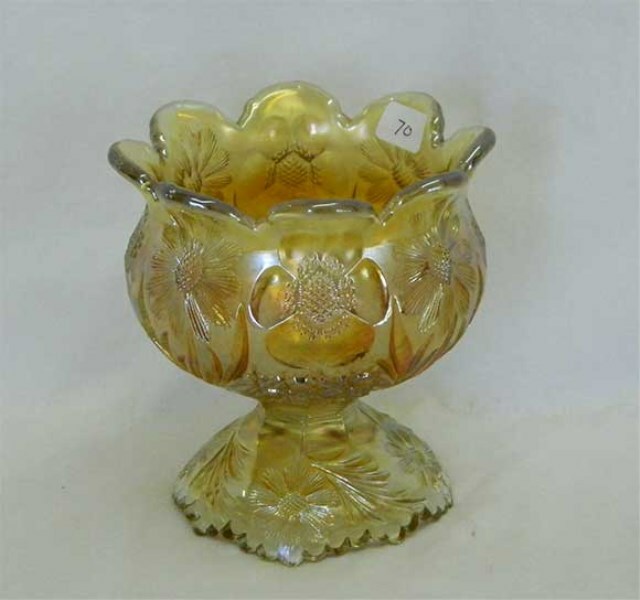 Stemmed compotes are very rare. 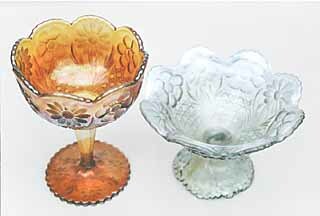 Dome footed compotes were often whimsied into spittoon shapes, rosebowl or punch bowl shapes, or a shape called volcano (photo below, right). 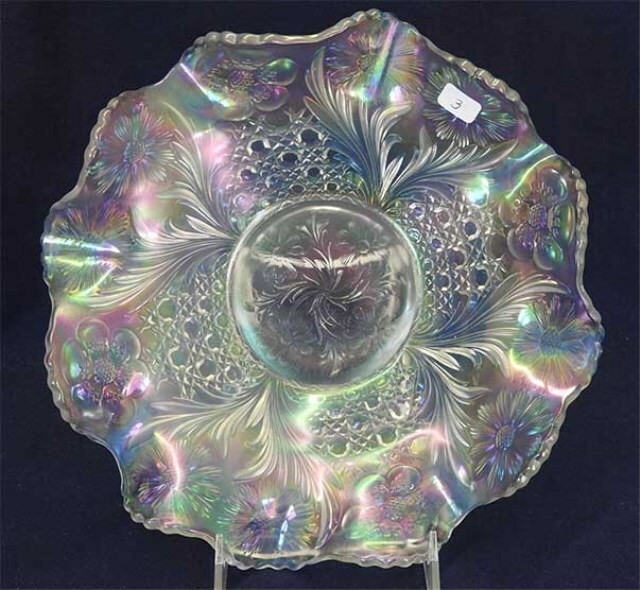 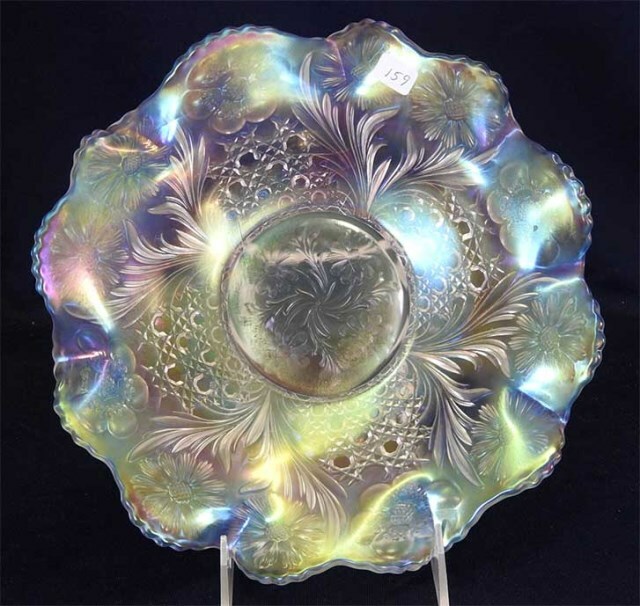 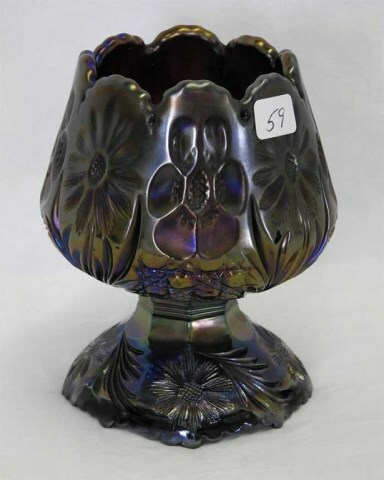 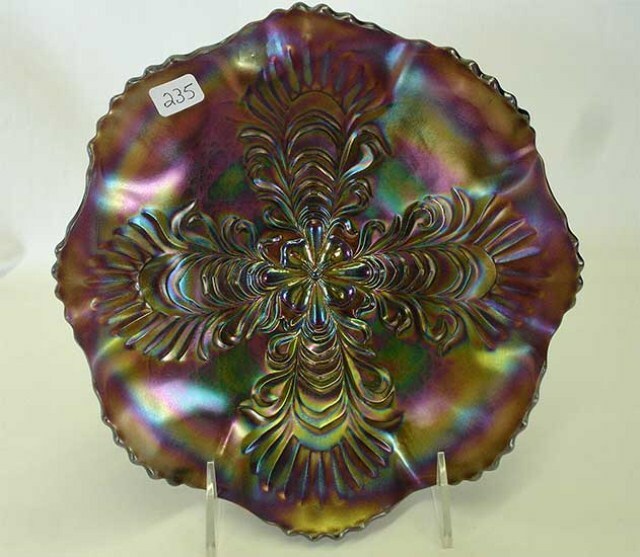 These two ladies' spittoons, about 3 inches across, sold at the 2004 International Carnival Glass Association convention auction. 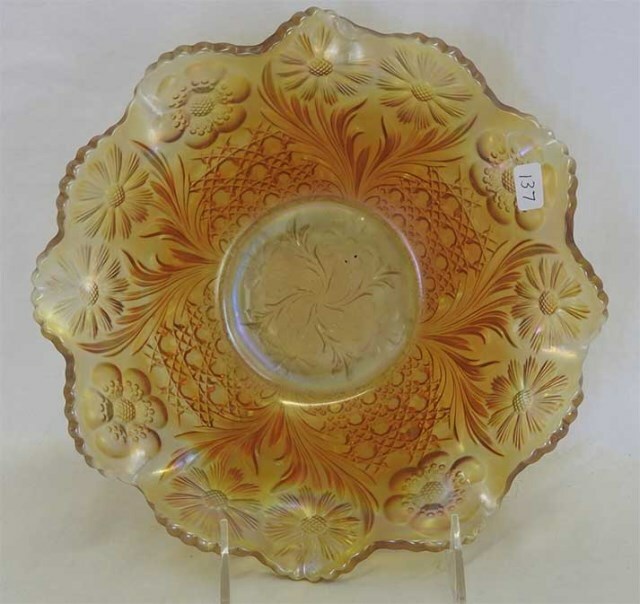 The white one sold for $6,500; the marigold for $6,250. 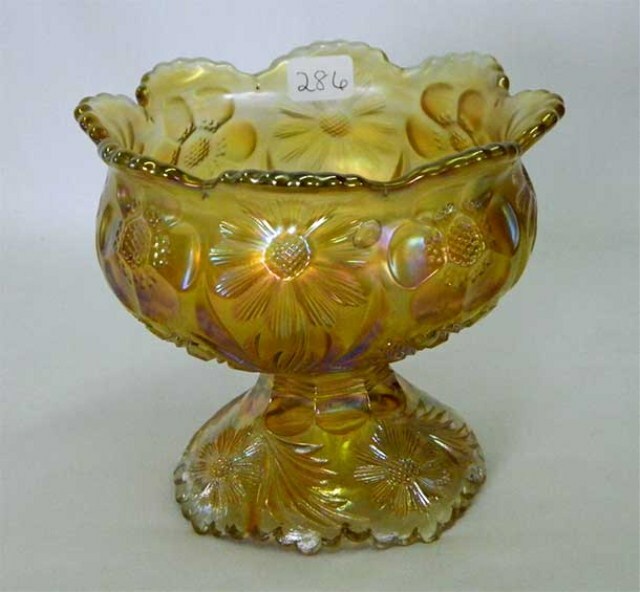 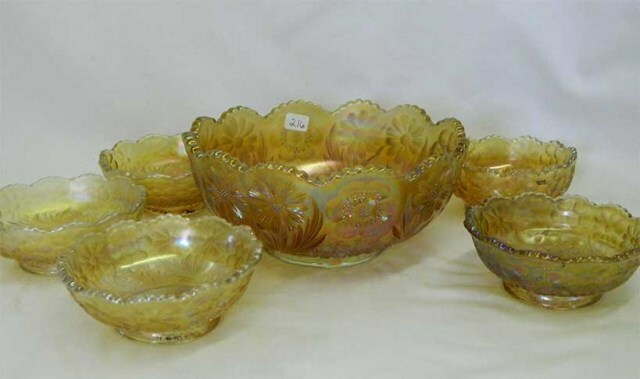 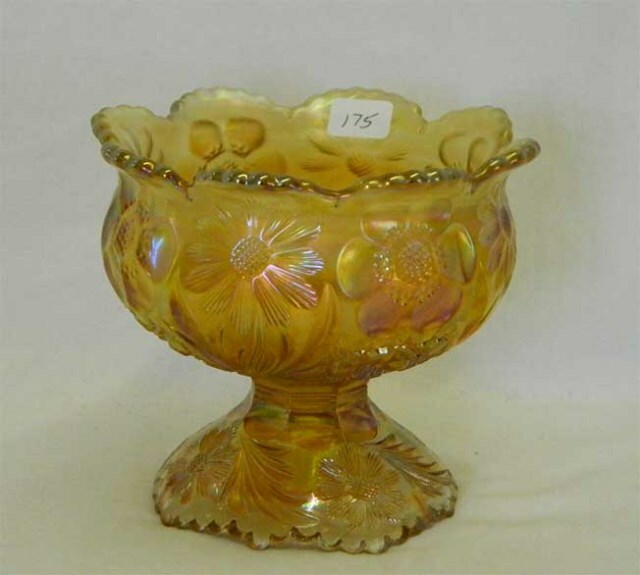 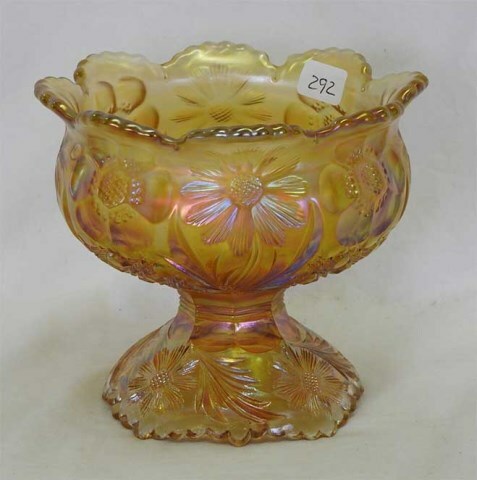 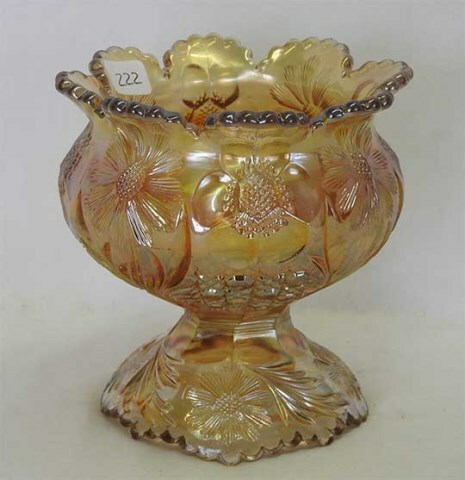 In 2010, two more spittoons sold; a honey amber for $2,300 and a white for $4,000. 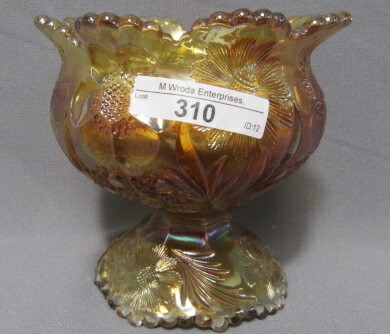 In 2011, a white example brought $3,000. 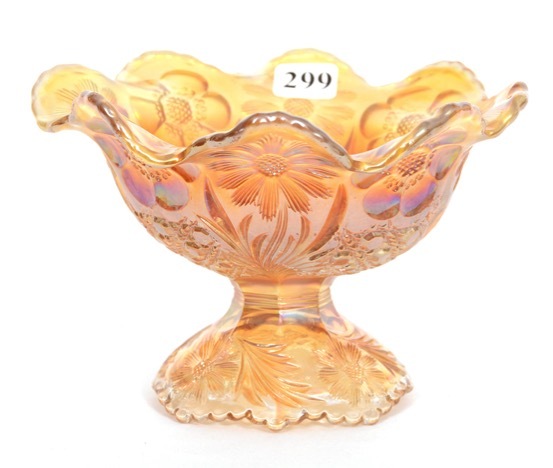 In 2012, two in honey amber sold for $2,150 and $2,500; a white example for $3,300. 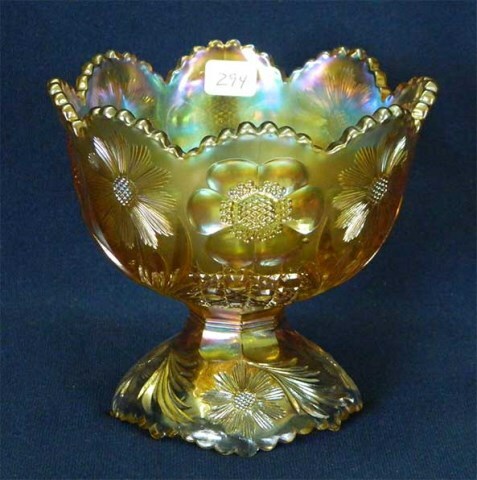 In 2013, one in honey amber brought $2,100.